Norvegian style “trve” Black Metal has become quite stale 10 or 15 years after it’s inception. The Atmospheric branch of Black Metal became increasingly more popular and new bands injected life into the genre, but the rawer, “truer” forms have stagnated creatively. Some scene elites have become legacy acts of sorts, releasing uninspired material, Black Metal gimmicks of lesser bands have become a target of ridicule of parodies and memes. Of course there were bands that kept the style alive, but it certainly wasn’t the most vital of Metal sub-genres. Things changed when a new crop of bands burst on the scene that share fondness of rawness, bleakness and a bit of dissonance. Polish bands MGŁA, KRIEGSMASCHIENE, BLAZE OF PERDITION or the US band UADA are making a mark and captivating audiences with music that is fast, aggressive but at the same time full of majestic atmosphere. 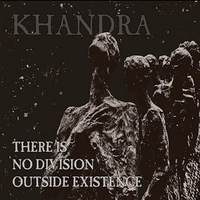 KHANDRA are a duo form Belarus and you can tell that they are into the new wave of Polish Black Metal, if I may call it that. Their second EP “There Is No Division Outside Existence” has one instrumental intro and three song, clocking at the 25 minute mark. The music has all the marks of MGŁA’s style, the controlled blast beats, the fast, addictive melodic riffs, the muffled growls. In “Deacaying Into the Ascend” the music shifts between a rhythmic groovy riff and fast tremolo picked riffs, there are also some more relaxed parts that give the composition some breathing space. The song has quite a lot of “oomp” to it as does the title song that follows, but I have a bit of a hard time distinguishing them form each other. The last eight-minute song “Progressing in Desolation” has less “oomph” unfortunately, it starts out nicely with evil dissonant riffing, but then comes a quite melodic hook that is so soft that seems kind of out of place. And the song is a bit drawn-out in my opinion. I like this release for the most part, it is a bit derivative but a band has to start somewhere. The way to the top is long and around the path lay the skulls of many who have fallen, but these guys show potential and hopefully will release interesting music in the future.